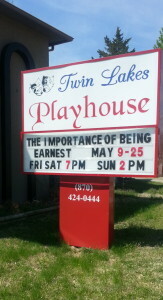 TWIN LAKES PLAYHOUSE was founded in 1971 by the former manager of the Baxter Bulletin, George Smith. In those early days, rehearsals were held in members’ garages. Sets were also built there and then transported to Mountain Home High School where the plays were performed in the auditorium. When the school decided to turn the auditorium into classrooms, the Playhouse had to search for a new location to present their plays. The decision was made to expand and put on dinner theater productions at the conference center at the Ramada Inn in Mountain Home. This was a success as everyone enjoyed the dinner format and the number attending the productions continuously increased. However, strong backs were continuously required because the Ramada’s stage was very narrow and additional staging had to be built in members’ garages, transported to the conference center, and assembled. All the sets were built and rehearsals held in various members’ garages. As staging material and equipment was accumulated, more garages were needed. It was then decided to locate a permanent place to store stage material and equipment and to hold rehearsals. In l979, a building in Midway was purchased. Productions continued to be presented at the Ramada Inn as the Midway building was remodeled. Finally in 1984, the first production was presented at the Midway theater. Everyone was pleased because sets could be built in place for both rehearsals and productions and stages no longer needed to be hauled by strong-backed volunteers. Most theater patrons liked the little intimate theater, but parking was difficult. However, with limited room for expansion, limited parking and the belief that a more central location Mountain Home would attract both more members and theater patrons, relocation remained a concern of the members and board of directors. Available funding and property costs limited short term relocation plans. However in 2000, the Playhouse found a good location in Mountain Home, took out a mortgage, and moved to its present location which was larger and more convenient. With fund raising efforts and much sweat equity design remodeling of the building took place. Remodeling continues. The comfortable seating, improved stage, convenient location, and community support have resulted in continued increased numbers attending performances at the new theater. Twin Lakes Playhouse has been a successful continuous “work in progress” that resulted in positive benefits for the volunteer members of the playhouse and the community at large. Through all the times of growth and change, quality shows continued to be presented. The number of shows each year has steadily increased. Early years had only two productions a year, in the spring and fall. Later an occasional summer production was added. Then the number increase to four plays a year. Now, the Twin Lakes Playhouse has strived for five productions per year.